I love soups. I love to make them and eat them. 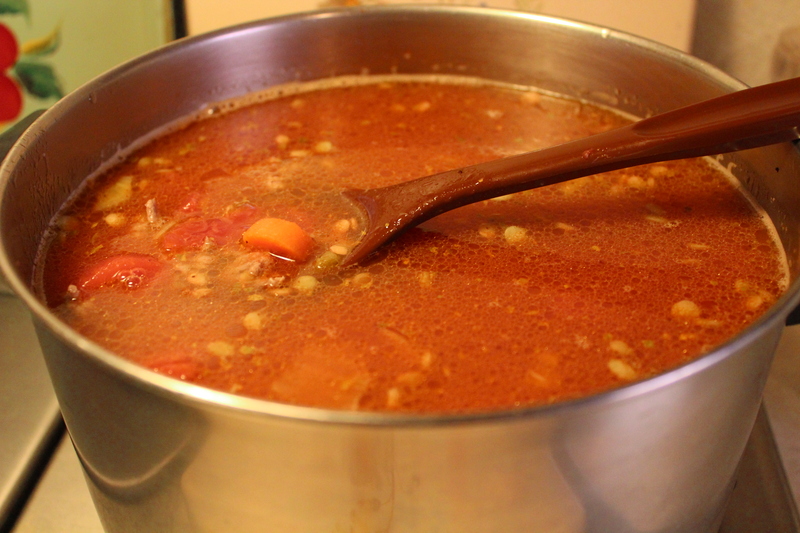 In fact I have gained quite a reputation for the variety of soups I make; hot or cold you can always eat soup. 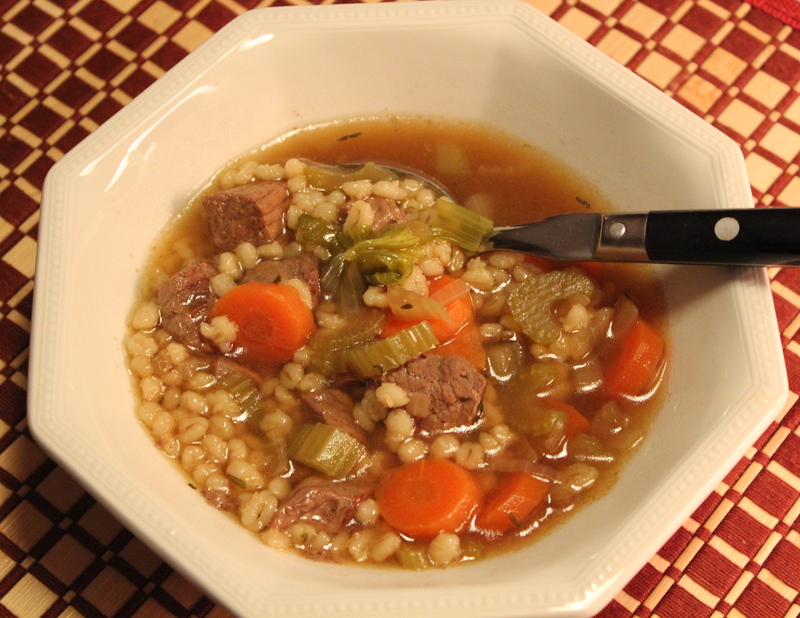 No matter what time of year it is there’s always a great soup to make. 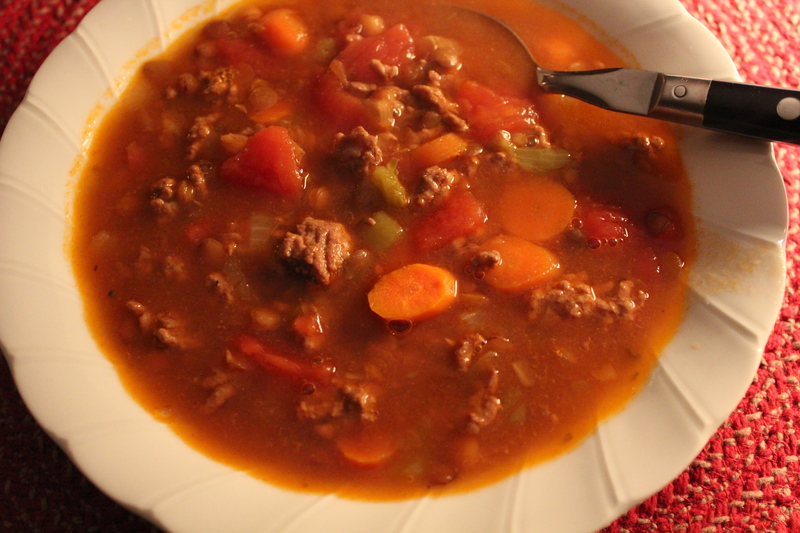 Starting in the Fall I think of hearty soups that include meat and lots of vegetables. Of course some soups are purely vegetable based, made smooth and creamy by pureeing. 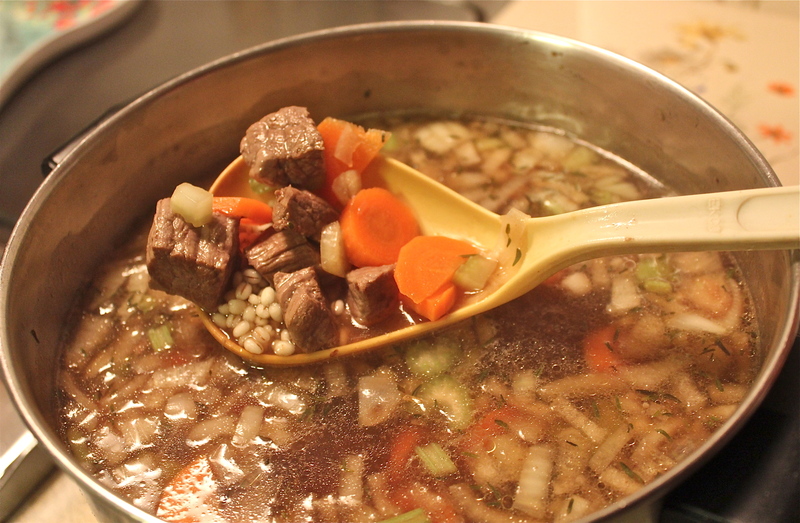 The soup I made a few days ago is one I’ve made several times before and both Mr. D. and I like it very much. 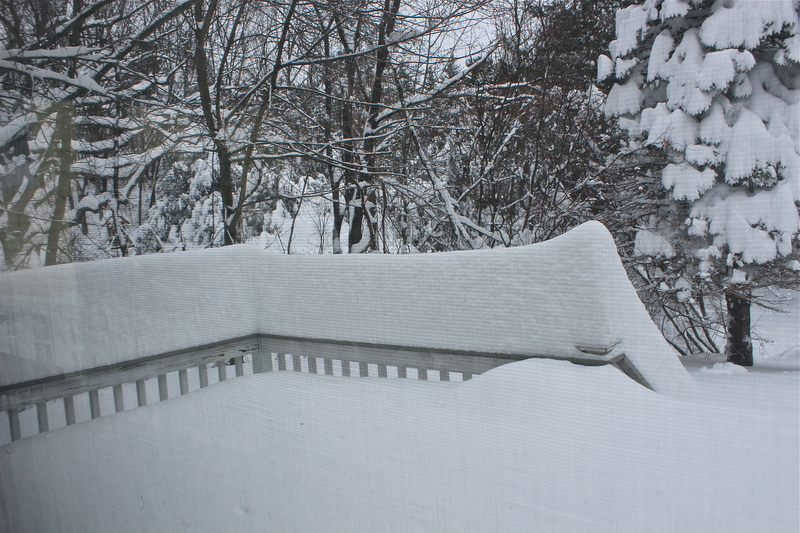 It’s sort of a cross between a soup and chili. 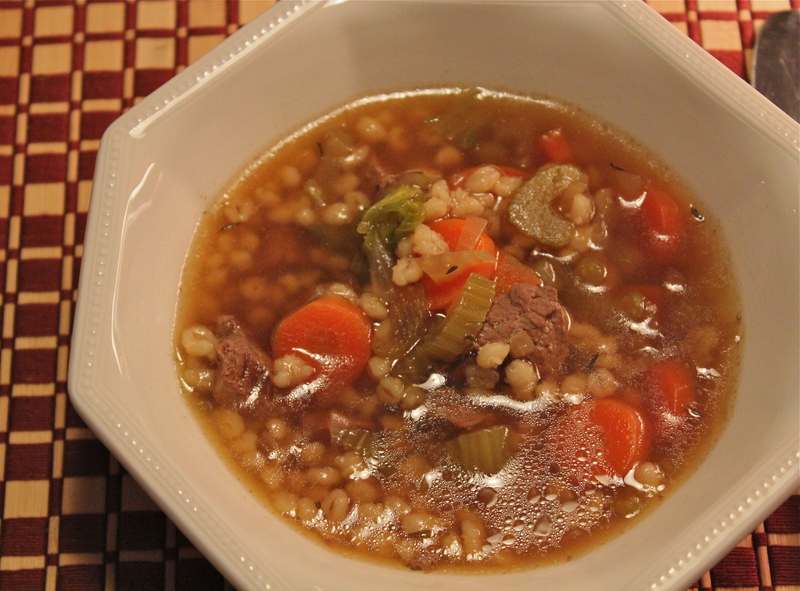 A beef and vegetable soup made doubly nutritious by the addition of lentils, and Southwestern seasonings to give it some zip. You might want to try this instead of chili for your next football party. Add a pan of spicy corn bread to go with it and you’ve got a terrific meal. (My recipe for corn bread will be featured in tomorrow’s post). This could easily be a vegetarian or vegan soup by omitting the beef, and perhaps adding some mushrooms for that meaty umami flavor. 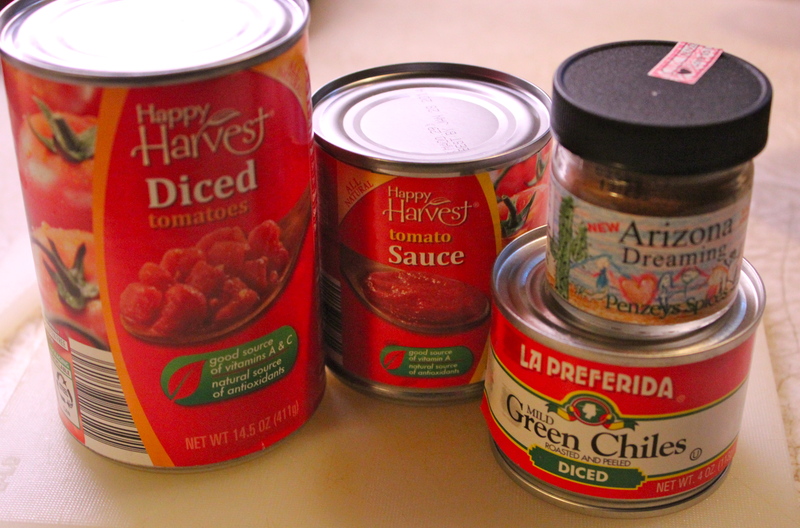 1 1/2 teaspoon southwestern seasoning ( This can be a combination of chili, cumin, coriander, garlic, etc.) I use Penzey’s Arizona Dreaming. 1. Rinse lentils, drain and set aside. 2. 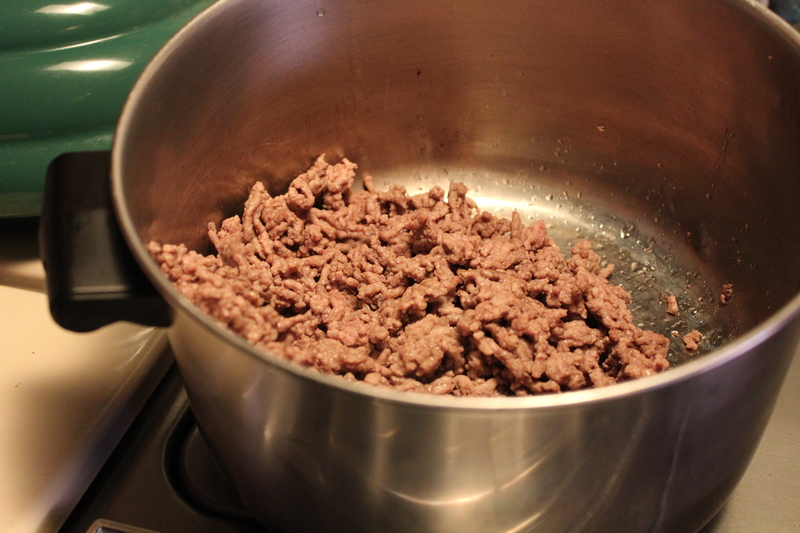 Brown the ground beef in a hot skillet or soup pot. Drain away the fat and set the meat aside. Brown the ground beef well. 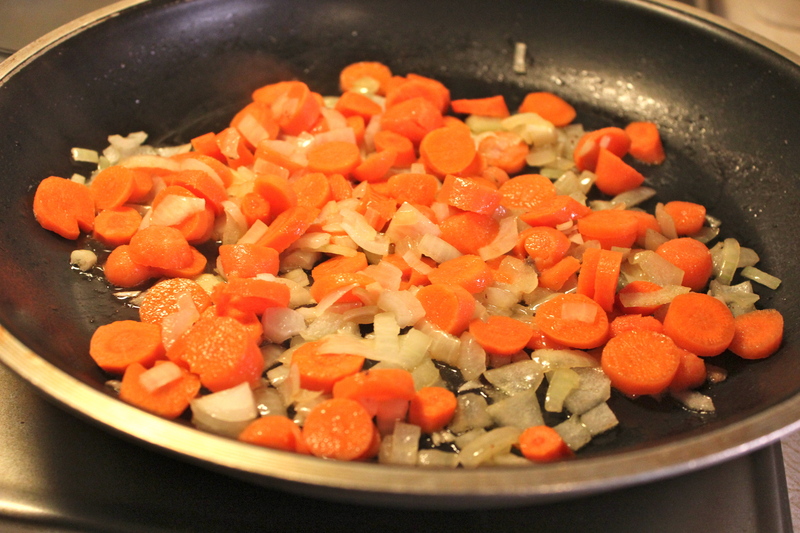 Lightly saute onions and carrots. 4. 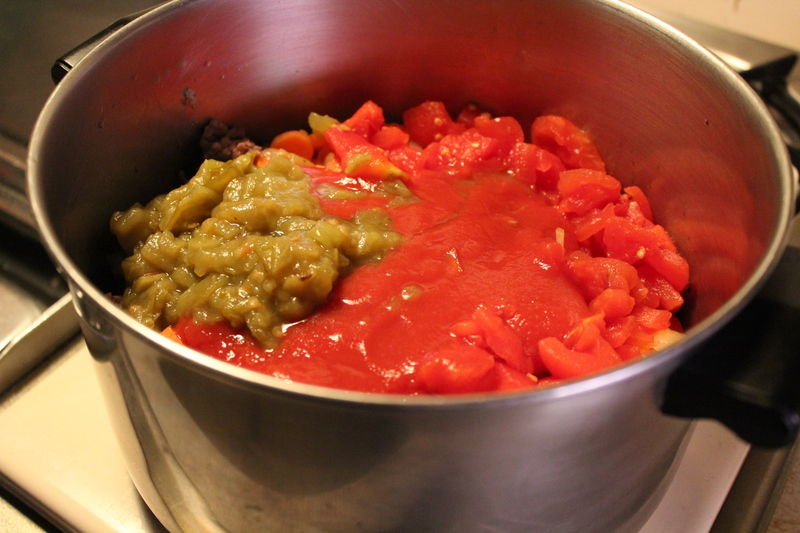 Add the lentils, beef, tomatoes, green chiles, tomato sauce, water, salt, pepper, and other seasonings to the soup kettle. 5. 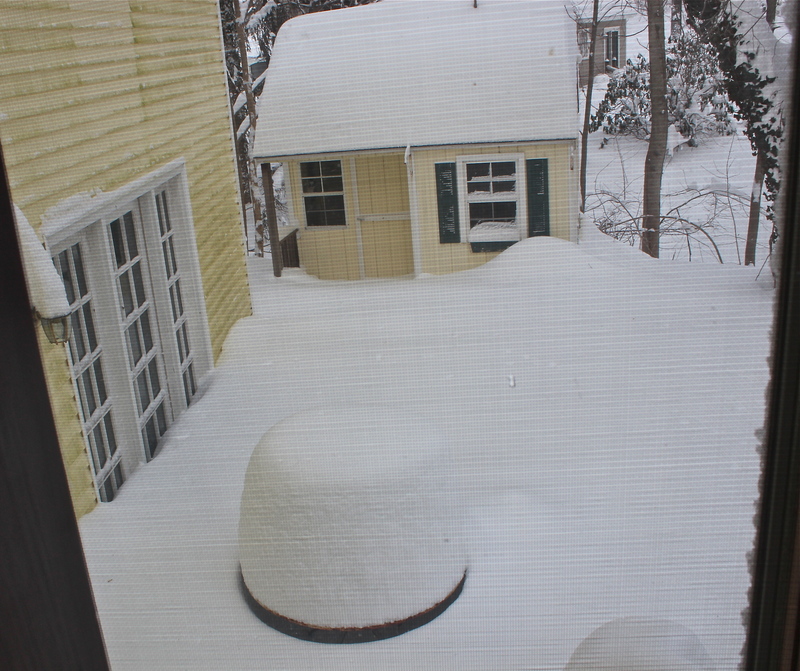 Bring to a boil, reduce heat and cover. Simmer for about an hour until lentils are tender. Stir occasionally to prevent lentils from sticking. You can really amp up the spiciness factor to whatever level you like by adding some cayenne pepper or chipotle pepper to the soup, or serve with some hot sauce on the table for those who like it a little hotter. 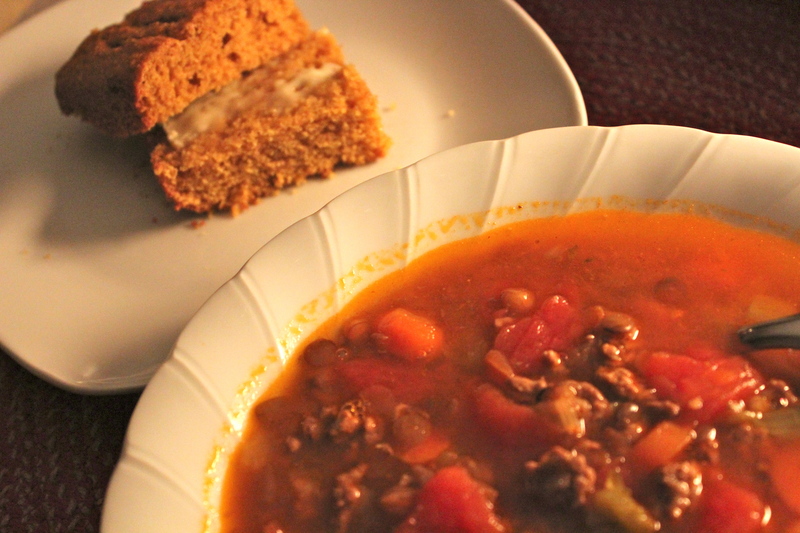 Soup served with Pumpkin Spice Corn Bread. 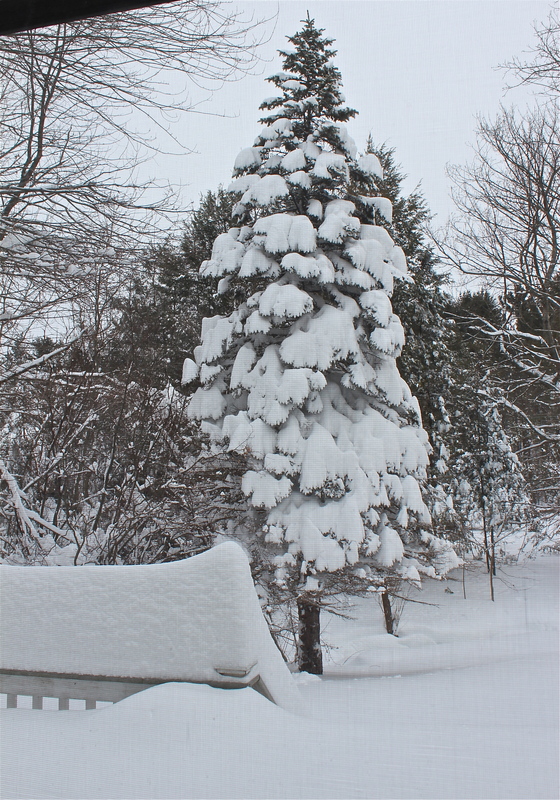 It doesn’t matter what season it is, I make frequent use of my crockpot, especially if I will be away most of the day. I love to come home to the smell of something wonderful cooking. 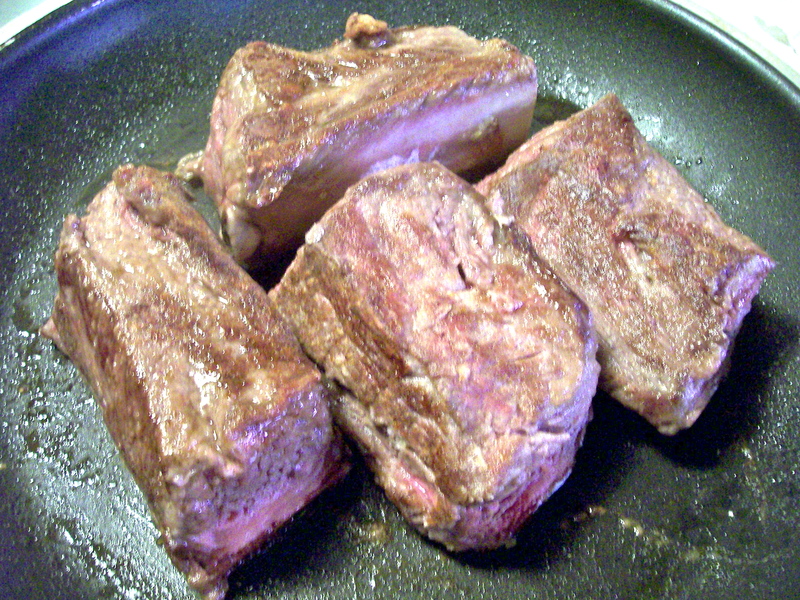 Today I cooked beef short ribs. Short-ribs are usually quite pricy at the market so we don’t have them very often, but this past week there was a special “truckload of beef” sale going on so I purchased some. 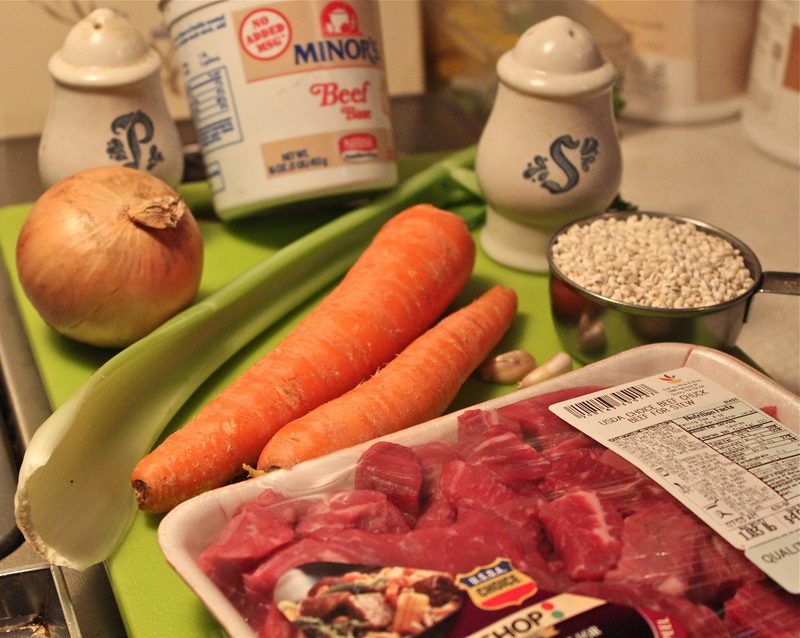 I have in my files several recipes for braised beef short-ribs, but for every one I was missing some key ingredient. So I fused together two different recipes and come up with this one. 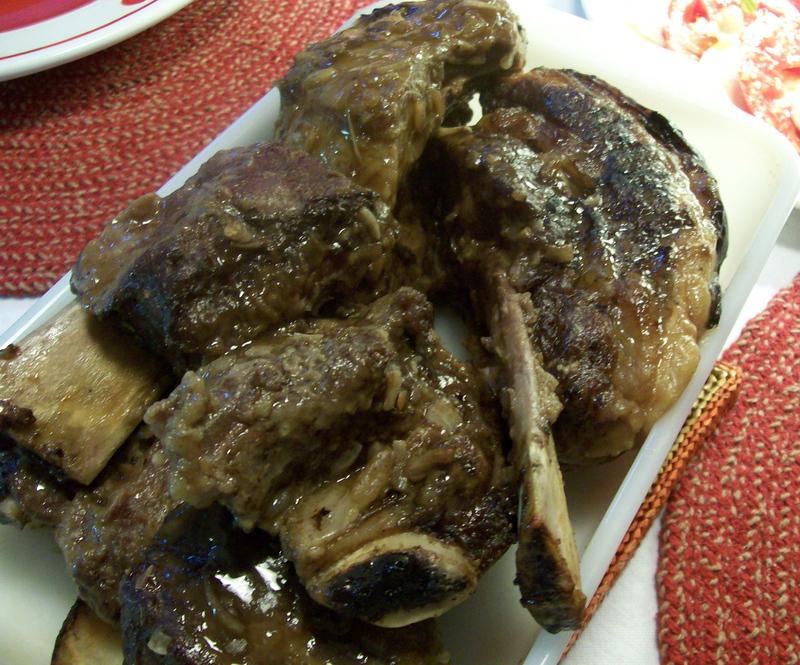 They came out very well; finger-lickin good and falling off the bone, with a nice gravy that I thickened with some of the seasoned flour I used to brown the ribs initially. I served this together with a mushroom risotto, and a medley of fresh garden vegetables. This is how I made the ribs. 2. In a shallow bowl, mix together the flour, smoked paprika, and allspice. Dredge the ribs in the flour mixture to coat. Shake off excess flour. 3. 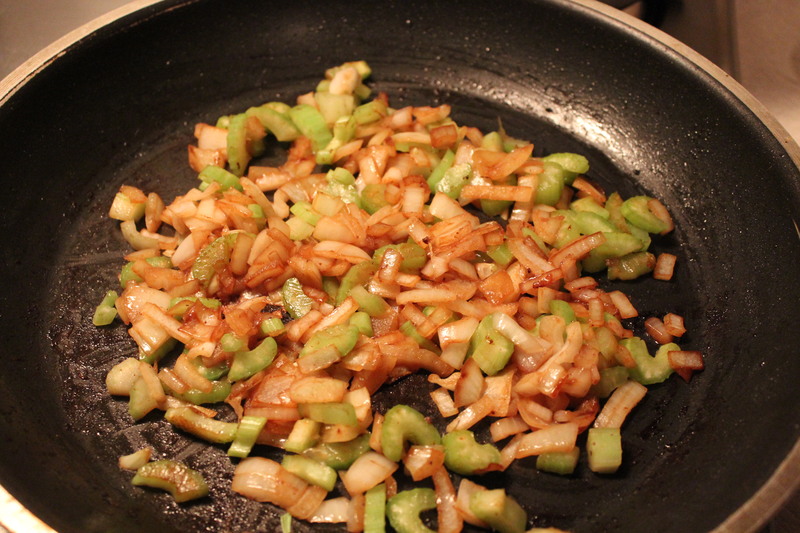 In a large skillet, heat the vegetable oil to hot, brown the ribs on all sides, in batches if needed. 4. 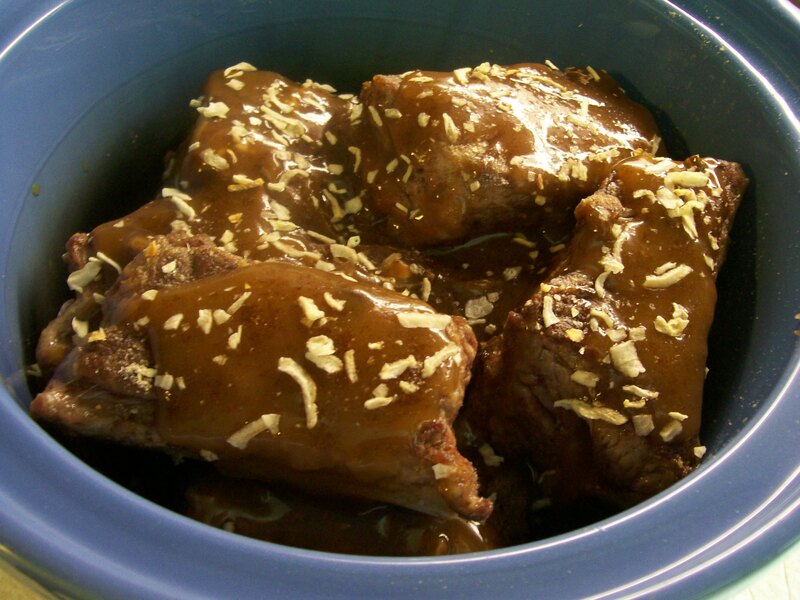 Place a few ribs in the bottom of the crock pot . Pour some of the gravy over them and sprinkle with some of the soup mix. Repeat with the remaining ribs, gravy, and soup mix. 5. 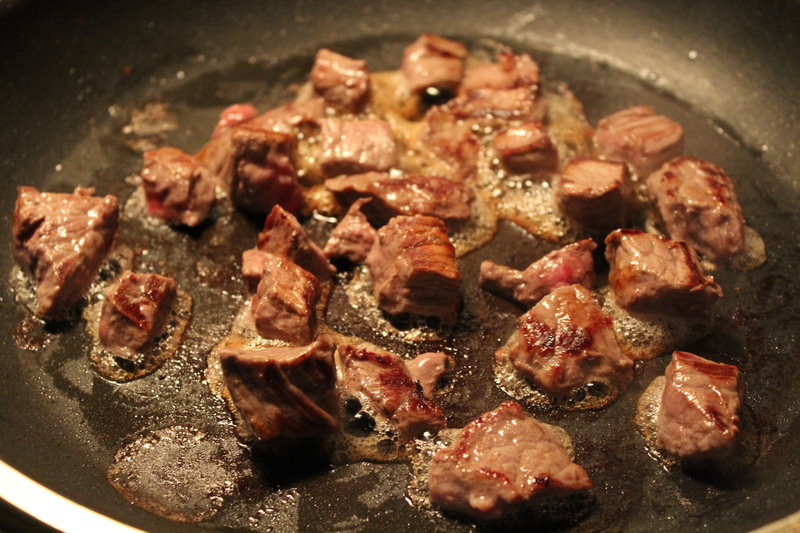 Cook on LOW for 6-7 hours, or on HIGH for 3 1/2 – 4 hours. 6. 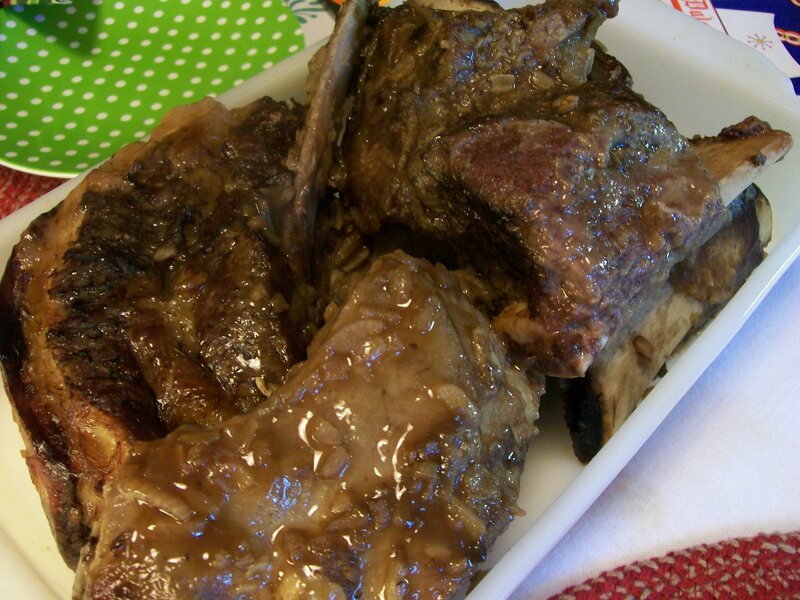 To serve: Remove the ribs to a serving dish and keep warm. 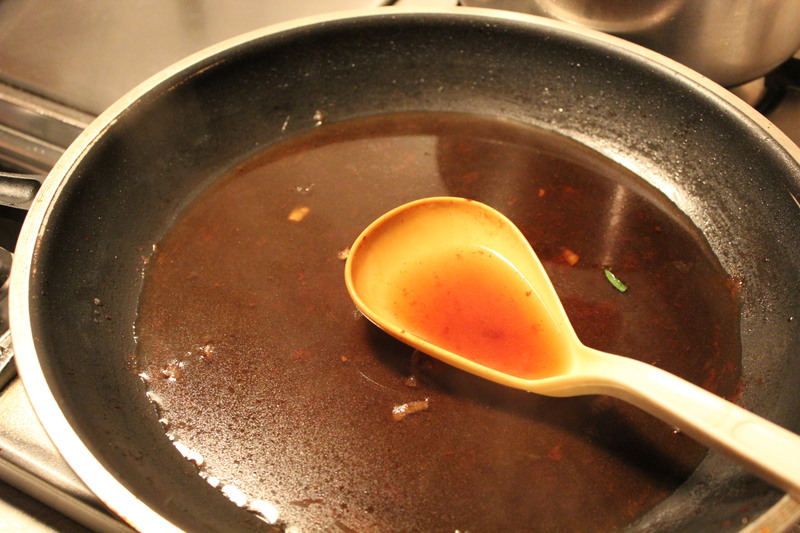 Make a roux out of 2 Tablespoons butter and 2 Tablespoon flour (use any seasoned flour left from dredging the ribs). Turn the crock pot up to HIGH so that the gravy simmers, add the roux and stir to combine so the gravy thickens slightly. Pour over the ribs and serve with noodles, mashed potatoes, or rice.